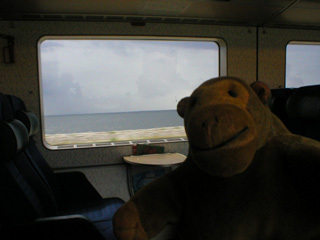 "The sea view is quite clear, though"
Mr Monkey's train went through a tunnel from the airport, then popped up on an artificial island called Peberholm. The only way off the island was on the famous Øresund bridge, which elegantly links Denmark to Sweden. It's an immense bridge. The high bridge is 55 metres above the water, and 1,092 metres long, and the approach bridges are 3,739 metres long to the east, and 3,012 metres to the west. 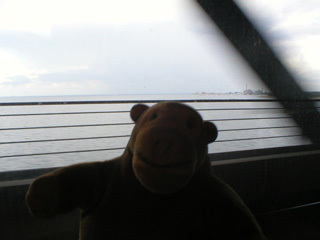 The only problem Mr Monkey saw was that the pillars holding the railway section below the road bridge spoilt the view when he tried to look at Malmö. You can read about the Øresund bridge at the Øresundsbron website.